The EU Settlement Scheme for EU citizens living in the UK is rolled out in ‘public test phase’ today, meaning EU citizens can start to apply for the status they will need after Britain leaves the EU, writes Steve Ballinger. The scheme should work simply and efficiently for most people. But the sheer scale of the task ahead, with the Home Office potentially required to register 3.5 million people by 1 July 2021 – or 5,600 people every working day – means that the stakes are particularly high. Even if 5% of eligible applicants struggle to apply or are rejected, this would equate to 175,000 people living in the UK without status. 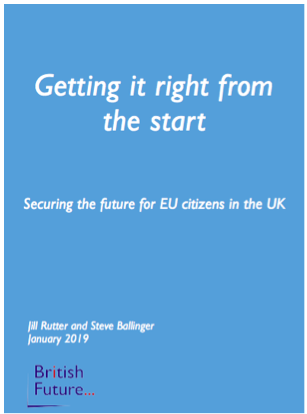 A new report from British Future, Getting it right from the start: Securing the future of EU citizens in the UK, examines in detail the potential barriers to securing settled status; who could be affected; and the actions that the Home Office should take to make sure that the system works as well as possible. Those barriers include people not hearing about the scheme or realising that it applies to them; struggling to provide evidence of residency or finding the system too hard to navigate; or encountering technical difficulties if the system cannot match names and official records. Politicians from across political and referendum divides expressed support for the new proposals. “British Future is right to highlight the grave risks that Brexit poses to the rights of EU citizens living in the UK. “No one seriously believes that the Home Office will be able to grant settled status to everyone who’s eligible within two years. Thousands will be left effectively undocumented and subject to Theresa May’s hostile environment. Should the EU Settlement Scheme experience problems, public trust in the Government’s ability to manage migration, already at a low level, would be further undermined. EU citizens will experience uncertainty and distress and employers could risk losing key staff who might chose to return to their home countries. So the successful delivery of the EU Settlement Scheme is an important test for the Home Office. Get it right and the UK sends a strong message that EU citizens are welcome and the Government is in control. Get it wrong and the consequences could be dire. Steve Ballinger is Director of Communications for British Future.